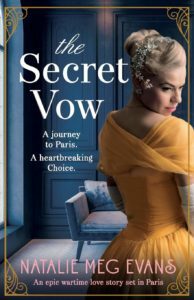 The Secret Vow by Natalie Meg Evans is an epic historical novel set in 1918 and 1919 at the close of WWI. The reader is in for a real treat as we travel from Russian palaces to Paris via Sweden. True breeding lasts in spite of circumstances. Once a princess always a princess. Atrocities inflicted on the aristocrats in Russia means trust comes hard. There is always someone willing to betray others for a quick buck. We witness the strength of character needed to survive. Some Russians are deluded into believing the Czar’s family survived and long to see them restored. Family matters. Family pull together.Unscrupulous people try to take advantage of grief. Forgiveness needs to be dished out but it is hard. War changes people. The moral code is distorted. People do what they can to survive. A truly epic read that will have the reader glued as we travel through a bygone era. Even war torn Paris still has an air of glamour and sophistication. A fabulous read.